Folks in Old Town Tustin are a pretty tight group and always willing to help out a worthy cause. This time, the cause is in our own back yard. The owner was determined to save what they could of this piece of history. More than the allowable amount of the building was destroyed so the city required any new construction to be built to code. 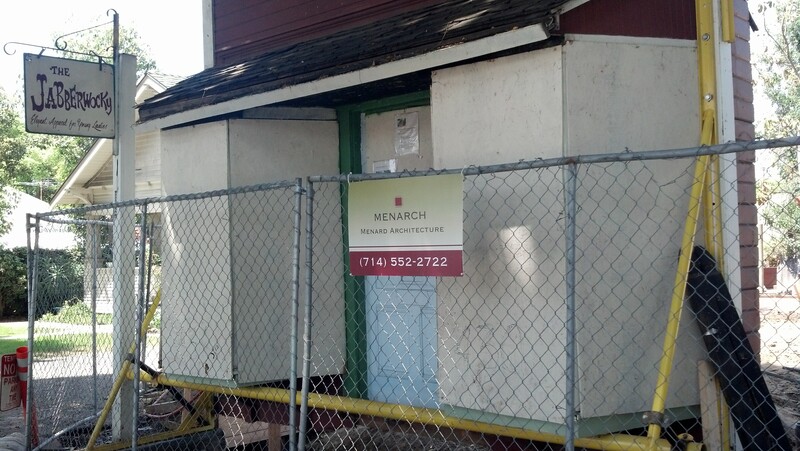 Local historic architect, Nathan Menard, was charged with marrying the old facade with the new building. It took awhile for construction to begin but the end result has been worth their effort. The facade has been saved and restored, and the new building is as safe as any in the city. But, it came at a cost. 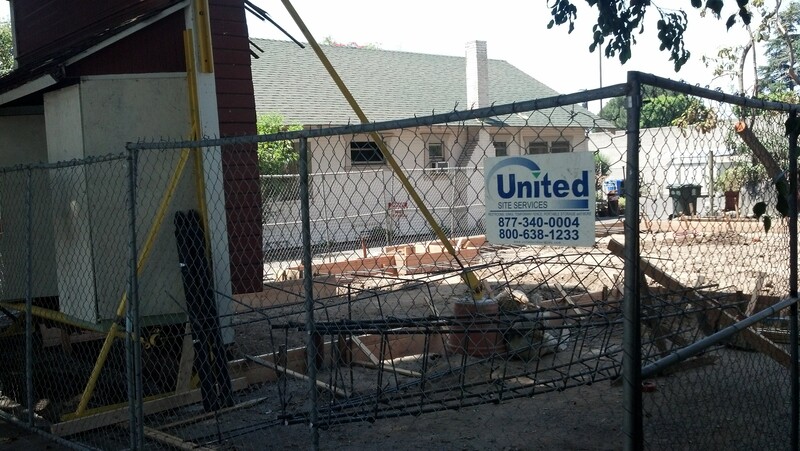 Even though insurance paid for the bulk of the construction, the owner still had to pony up some money of their own for ancillary costs. 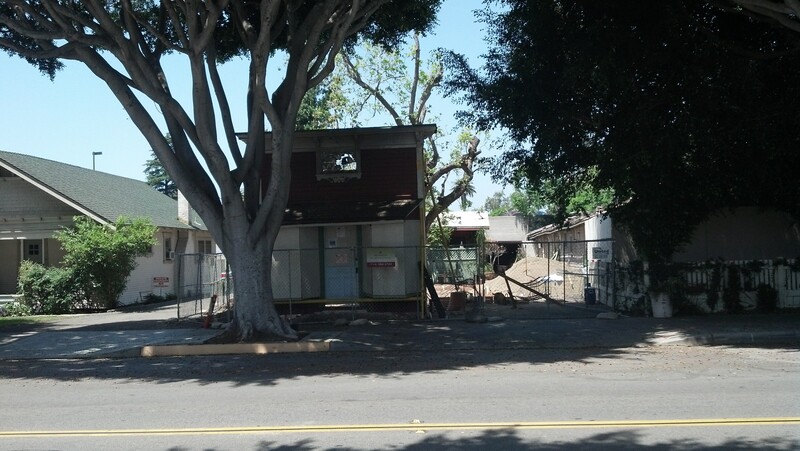 The Tustin Preservation Conservancy has stepped in to help. The Tustin Preservation Conservancy has opened a campaign on the Go Fund Me web site to raise funds to help finish the Jabberwocky building. As you may remember, it was partially destroyed by fire several years ago. The owner chose not to demolish but rebuild the damaged rear of the building and restore the beautiful Victorian facade. Go to www.gofundme.com/n2riac and look for ” Restoring the Jabberwocky” to visit the campaign site and learn more. Any donation will be appreciated. The Conservancy will pay all fees so your entire donation will go to the fund and be tax deductible. Yes, you heard it right. a hundred percent of all funds donated to the Jabberwocky through this campaign will go to the restoration. Tustin Preservation Conservancy will pay all fees associated with the campaign. If you love Old Town as much as we do, we hope you will donate a few dollars to the cause. Any amount is the right amount and will certainly be appreciated. The other day, we were riding down El Camino Real when we noticed construction workers walking around Jabberwocky… well, sort of. There wasn’t much of it to walk around since, sometime in the recent past, they tore down nearly the entire building, leaving only the facade up. 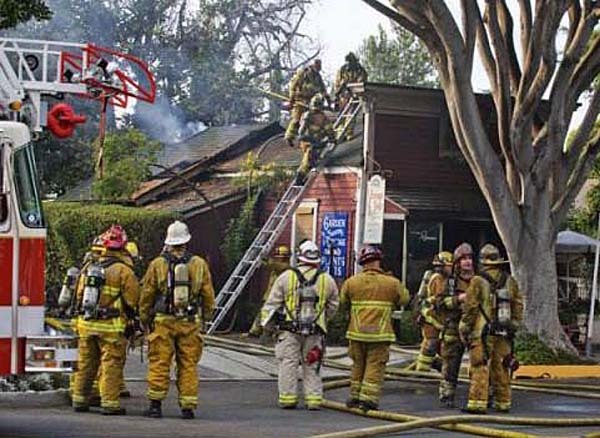 It’s unfortunate that the building, one of the oldest in Tustin, was burned so badly back in 2011 that many thought it would be lost completely to the annals of history and the collective memories of our local historians. But, as luck would have it, the building, originally a doctor’s office built around 1885, was saved from the wrecking crew. Well, some of it, anyway. As you can see from the pictures, the entire building, save for the facade has been torn down. 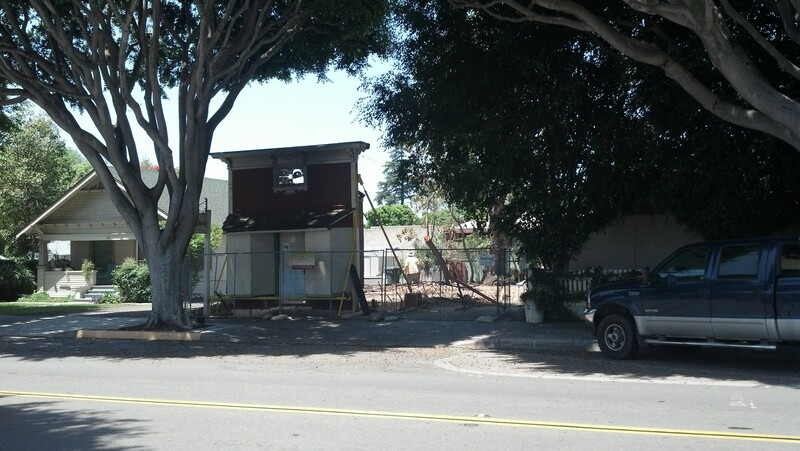 This was considered the safest way of preserving a piece of Tustin history while allowing the owners to also build a new up-to-code building that woud pass muster and Elizabeth Binsack’s code-busters. Architecural work was completed last year by local historic achitect, Nathan Menard. Menard is a well-known designer (or redesigner) of both historic buildings and newer buildings where the historical aspect of an area is important. His plans for the Jabberwocky continue that effort. When I approached the bulding, I almost laughed out loud. This is the classic facade of the old western town with the unadorned building behind it. There isn’t much right at the moment. The construction is focusing on foundation right now and it gives one the idea of how large the building will be (it isn’t). I would say not much more than the old building itself although Nathan assured me it will be adequate for the owner’s needs. And, what will the owner do? As far as I know, plans are to reopen the Vintage Lady, the store that was located there at the time of the fire. The owner has rented the store almost continuously to others since 1985 and lives in the home to the rear. The store, which has been determined to be historically significant due to the rare construction type, will probably never make it to the National Register. But, thanks to the owner’s perseverance and the help of Menarch Architecture, Tustin will continue to enjoy the Jabberwocky.